This post has been lingering in the draft folder for quite some time. 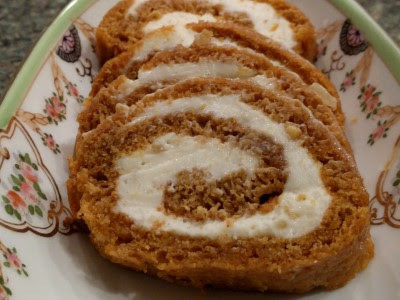 Over the holidays, we made Ina Garten's Pumpkin Roulade with Ginger Buttercream. I'm pretty sure I saw her make it on one of her shows quite some time ago but I forgot about it even though it sounded yummy. Then the recipe showed up in either the November or December issue of Food Network Magazine. Since I know SP likes pumpkin a lot and loves ginger a lot, I ripped out the recipe. We made this cake the weekend before Christmas. It served 2 purposes: a dish for a party and dessert (in addition to cookies) the day we had an early Christmas dinner with my parents. Jelly roll cakes are pretty quick and easy as long as you aren't intimidated by rolling the cake up in a towel, unrolling it to spread on the filling, and then re-rolling it. This cake is light and filled with the smells and tastes of ginger, cinnamon, and nutmeg. The filling is smooth and creamy and gingery thanks to the chunks of crystallized ginger. Adding to the rich, creamy smoothness is the mascarpone, which to me makes a much tastier filling for jelly roll cakes than cream cheese. Not that I'm going to turn down cream cheese filling, I just think the mascarpone is a little smoother and richer and not as heavy/dense. We did one thing different from the recipe: instead of rolling from the short end of the cake, we rolled from the long end. 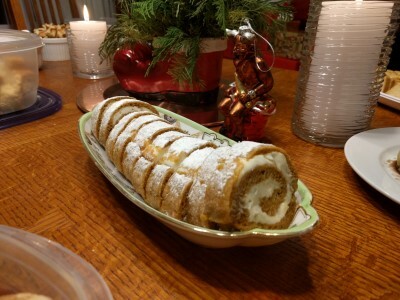 This didn't yield as much of a spiral but it made for a longer log which meant more slices for the party and dinner dessert plus 1-2 extra nights of dessert for us & my parents (we sent them home with leftover cake). Definitely a good fall/holiday dessert. I'm sure we'll be making this again in 9-10 months!